As businesses expand analytics to make data-driven decisions across the organization, it becomes critical to business operations that drive business growth and gaining a competitive advantage. SAP HANA is an in-memory, columnar database that enables fast analytics results for real-time decision-making to improve customer sales and service, as well as operational efficiency. SUSE offers a complete solution to improve your HANA system availability, including features like HA clustering, automated system replication, live kernel patching, and more. 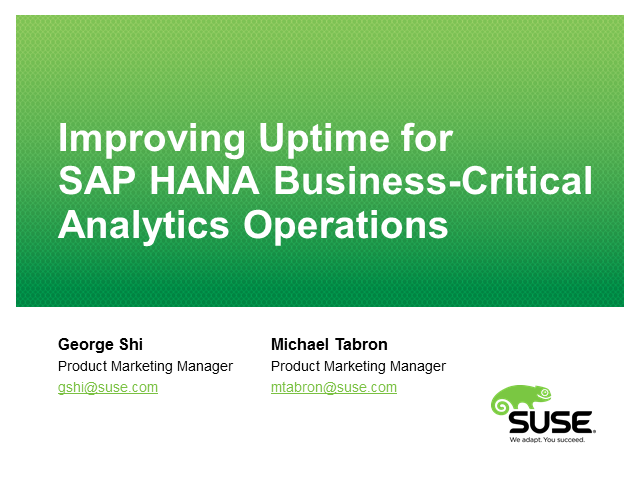 In this webinar, we'll explore details for how you can meet line of business requirements for a highly available SAP HANA system towards zero downtime.